Posted: February 15, 2018 in Sports Racers, Who,What,Where & When...? Alongside her is the obscured Bugatti T37A of three-time Australian Grand Prix winner Bill Thompson and the Chryslers of E Patterson and #72/14 HJ Beith. In the politesse of the times Mrs JAS Jones ‘married well’. Her husband Mr John A.S. Jones, ‘Lithgow’s leading businessman’ owned the ‘Zig-Zag Brewery’ and ten hotels. Lithgow is a city in the New South Wales Central Tablelands region 150 Km west of Sydney. The cashflow of these enterprises provided the means for Mrs Jones ‘…a very congenial hostess who entertains lavishly at her homes in Lithgow and Darling Point, Sydney’ to acquire some wonderful racing cars including the ex-works 1929 Mille Miglia Alfa Romeo 6C1750 SS Zagato chassis number ‘0312894’. This car played a significant part in Australian motor racing into the late 1950’s being much raced, ‘climbed, trialled, crashed, bashed and modified before being ‘rescued’ and restored in the seventies and eighties. Jones was one of the great pioneers of Australian motor racing- born Nina Vida Harris in 1882, her motoring career started in the family Chandler and then progressed to a Crossley ‘which she raced at Maroubra with a measure of success’. After a trip to Europe ‘witnessing real motor racing in France and Italy between Bentley, Sunbeam, Alfa Romeo, Mercedes and Bugatti concerns’, she acquired the Alfa, which was soon shipped to Australia in 1929. It is said she tested the Alfa Romeo model range together with Giulio Ramponi, works driver before choosing the 6C1750 SS, and an astute choice it was for the range of events run in Australia at the time. 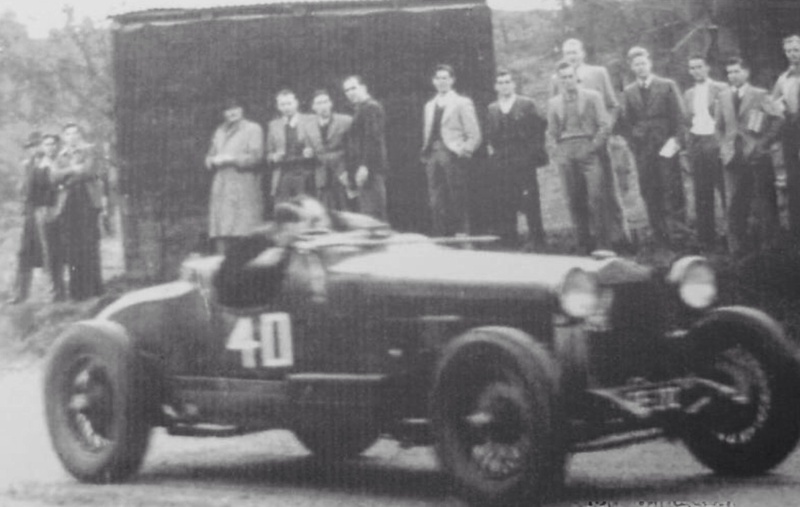 Ramponi co-drove the winning 6c 1750 SS in the April 1929 Mille together with Giuseppe Campari. ‘Racing Sports Cars’ in its race results listing offers the tenth placed 6C 1750 SS driven by A Bornigia/Carlo Pintacuda as possibly chassis ‘0312894’ whilst John Blanden in his book suggests the car as ‘reputed to be’ the sixth place Minoia/Marinoni machine. 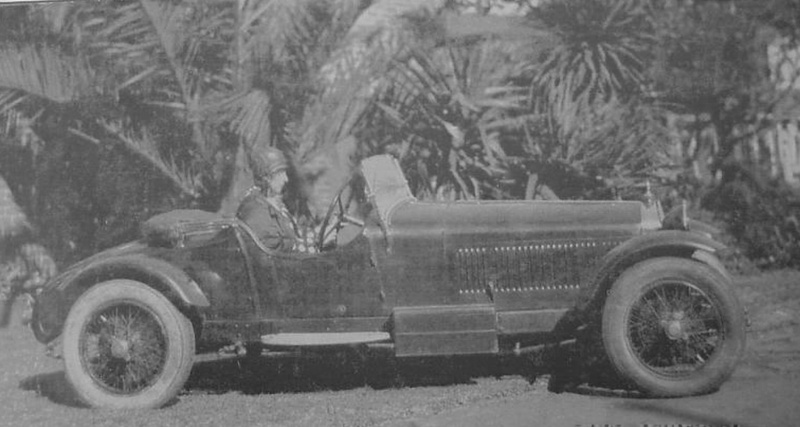 Jones was immediately competitive in the thoroughbred, over the next few years she was a regular competitor in the large number of ‘Reliability Trials’ which were the staple of New South Wales Royal Automobile Club and Light Car Club events. These contests always included speed tests, typically acceleration test(s) and more often than not a hillclimb. 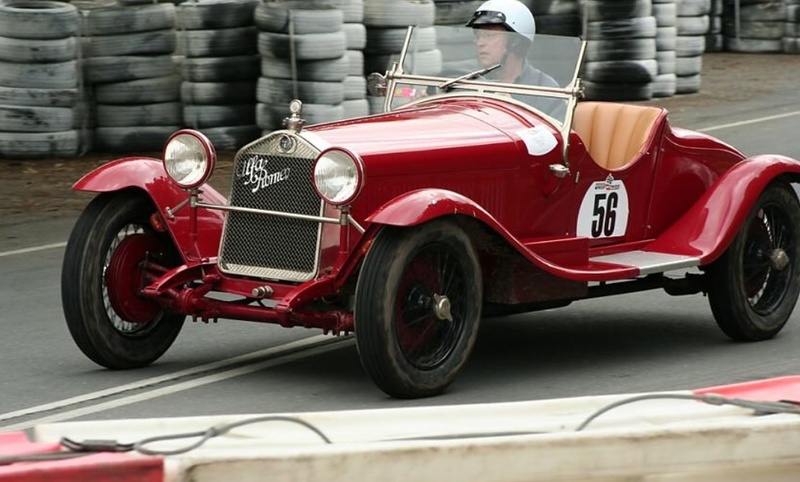 The 6C1750 was immediately one of the fastest cars in the country, the Bugatti T37A of four-time Australian Grand Prix winner Bill Thompson always gave the Alfa a run for its money whenever it competed in these events. More often than not Jones won her class and occasionally set FTD. It appears her earliest event was the RACA reliability trial run out of Canberra in August 1929. She contested another of these events in September establishing second fastest time of the day at the grass surface Prospect Hillclimb and another from Sydney to Cattai Creek in December. 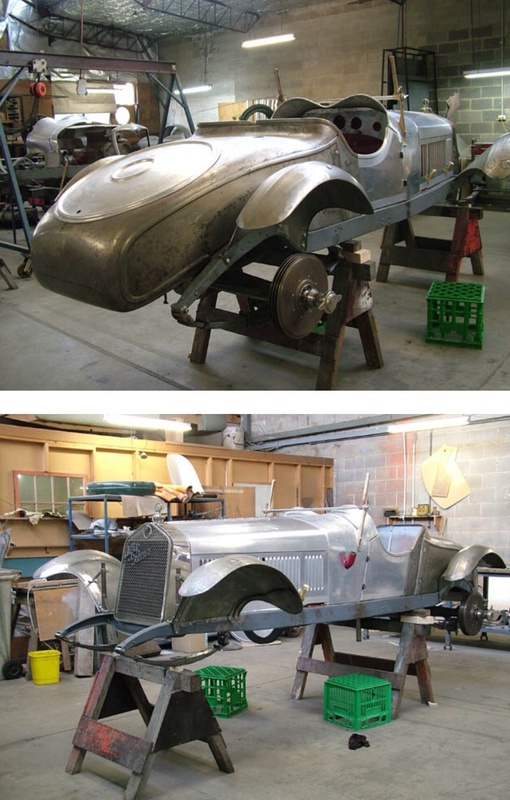 The cars 1930 logbook commenced with the Prospect Hillclimb in February and the RACA Sydney to Robertson Reliability Trial. Disaster was only narrowly averted in her next appearance at Gerringong Beach, in the NSW Illawarra 130 Km to Sydney’s south in May 1930. 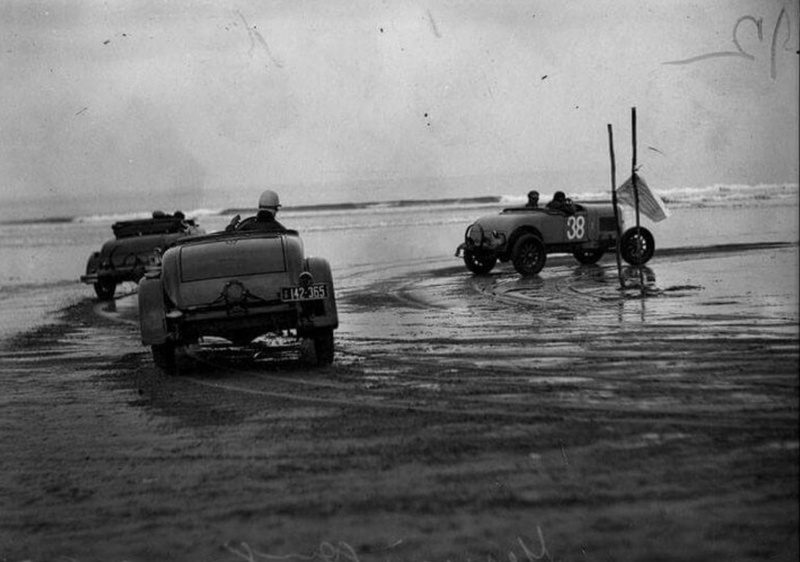 Car racing was held on the beach during the twenties and into the post-war period. Travelling last of four in a heat of the Four Mile Handicap at well over 100mph numerous spectators surged forward, the first three cars having passed the finishing post, onto the sand track to see the Alfa take the chequered flag. She hit one man, a Chrysler mechanic, Norman Curley having avoided several other people who had come too far, hurling him into the air and breaking his leg. Bill Thompson was the star of the day at Gerringong winning several races including the feature event, the Sydney Bicycle and Motor Club Fifty Mile Handicap off the back of his AGP win in the same chassis at Phillip Island on March 24. In a sequel to the breaking of the mechanic’s leg, Mr Curley took action in the Darlinghurst Court against Jones for alleged negligence for 1000 pounds in damages in June 1931, having spent seven weeks in hospital after the incident. Unsurprisingly, the jury found in favour of Jones, a competitor not an organiser of the meeting and therefore not someone responsible for crowd safety. The matter was not left to chance, Jones was represented by Kings Counsel at some considerable expense to the years racing budget. Nina was said by the Sydney press to be entered in the 1930 Australian Grand Prix at Phillip Island but did not compete in the race won by Thompson’s Bug T37A. In June a standing quarter mile competition was held on the Bondi Beach promenade, she did a time of 18.2-5 seconds and beat 64 other competitors in what would have been quite a spectacle. A dog dashed onto the course during one of Jones’ runs whilst the Alfa was flat chat at full speed, disaster was averted by the experienced pilot veering around the frightened hound and applying the brakes ‘causing the car to twirl almost around’. The earliest reported event in 1931 is the June LCC Trial from Sydney to Avon Dam, she won her class acceleration test. In May she set a speed record for women at 93.264 mph over a measured half mile at Richmond and was disappointed with the result, her run in was too short she felt. Jones did another of these trials in July and in August- this time from Sydney to Wisemans Ferry where she did the fastest times for supercharged cars. In October the Alfa was pointed to the Razorback where the combination were quickest in both the subsidiary acceleration tests and the hillclimb. Mr A Hunter competed in the car at Maroubra after it was reopened in July 1932 in a weird event comprising a series of acceleration, braking and parking tests. The following month Jones ‘threw the keys’ of the Alfa to the great Bill Thompson who had a steer of it in an LCC acceleration test event. It would be interesting to know his ‘compare and contrast’ thoughts of the six-cylinder supercharged Alfa Romeo Sportscar with his four-cylinder supercharged Bugatti Grand Prix machine. In a famous 1933 incident recounted down the decades Jones had her first big accident. A convoy of ‘ten of the fastest sportscars in Australia’ set out from Sydney to Melbourne and thence down to the Westernport Bay to witness the Australian Grand Prix at Phillip Island- the drivers turning the journey into a race and ‘thundering down the Hume Highway at near Grand Prix speeds’. 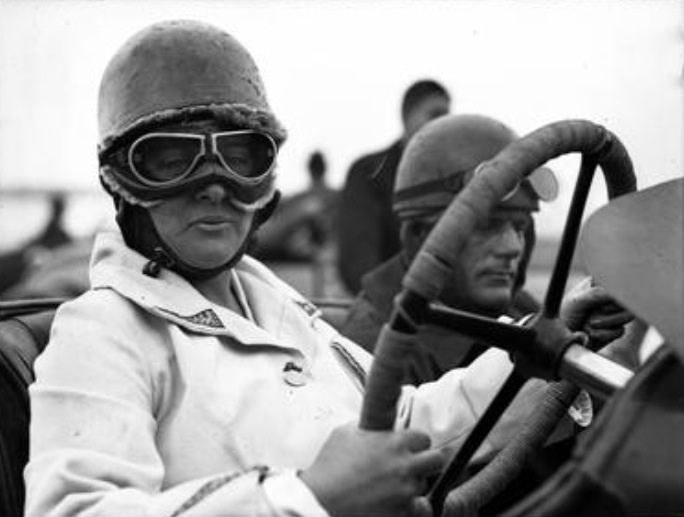 Jones with her daughter Vida as passenger, having easily outdistanced the rest of the group, when cornering at over 100 mph near Albury had a nail puncture a rear tyre causing the car to roll whereupon Vittorio Jano’s greatest caught fire and was substantially damaged. ‘Travelling around the corner the next man along, John Sherwood (a racer of considerable aplomb)…found the two women practically unhurt but dismally watching their car crackling furiously. The Alfa was burnt right out after unsuccessful efforts were made to put out the flames’. To add further to the family woes, the patriarch, John AS Jones died in May 1933. 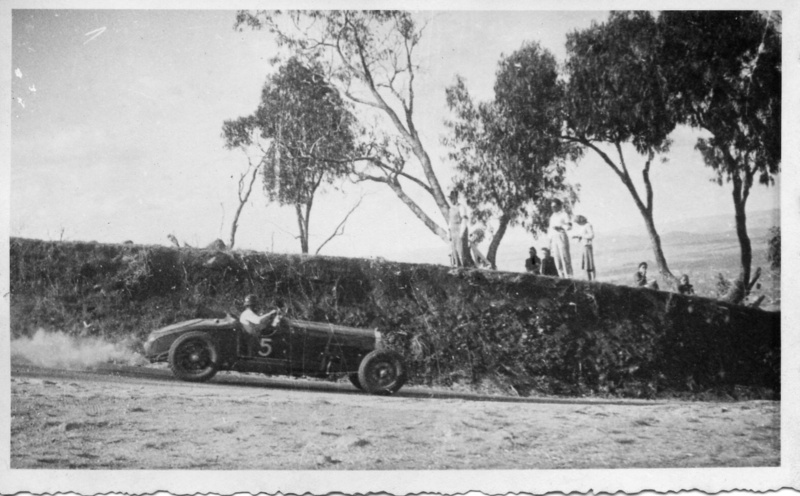 The Alfa was rebuilt by local artisans in Sydney with parts imported from Italy, making its post rebuild competition debut at Bar Beach Hillclimb, Newcastle in August 1934. In another disaster, Jones son Jack, also a racer, after his own run in the Alfa, took his mother up as passenger, lost control, crashed, overturned and hit a telegraph pole gifting his mother a broken thigh and six weeks in hospital. This second incident, with no doubt her husbands death on her mind, determined the lady racer to retire, she still occasionally drove the 1750 but the more ‘intense’ of events were contested by personal friends driving the car. Jones did not lose her pace however, as late as April 1937 she won her class FTD at Waterfall Hillclimb in the exotic supercharged machine. Son James won the local River Lett Hillclimb near Lithgow in July 1937. The Jones family finally parted with the much loved and well used car in 1938. John Blanden records the March 1938 advertisement in ‘The Car’ claiming ‘0312894’ to be completely overhauled and in perfect mechanical condition. The reported cost of the Alfa when landed in Australia was 1750 pounds. Claims were made for hillclimb records at Waterfall, Robertson and Kurrajong in NSW and Mount Tarrengower, Maldon, Victoria. John Barraclough Sporting Cars of Sydney handled the sale with Barraclough, an ace of the time, racing the car at Penrith Speedway in April ’38 to keep the car in the eye of potential purchasers. Graham Howard’s biography of Lex Davison records that Lex’ father AA Davison at one stage considered buying the ‘crashed 1750 Zagato Alfa’ but perhaps this was after one of the earlier accidents not in 1938. Barraclough entered the car in the April 1938 Australian Grand Prix won by Peter Whitehead’s ERA R10B at Bathurst but the car did not start- whether John practiced or did not appear because of the cars sale, or some other reason, is unclear. After the car was advertised for a short time ‘Racing Ron’ Edgerton purchased it. 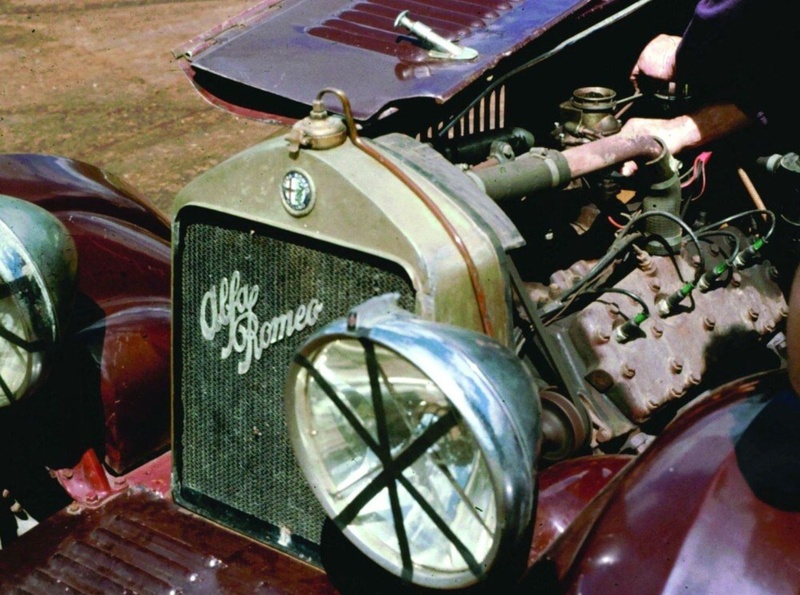 In a disastrous, expensive start to his ownership the engine ingested a loose part of the carburettor and comprehensively destroyed itself on the way down the Hume Highway from Sydney to Edgerton’s home in Melbourne. 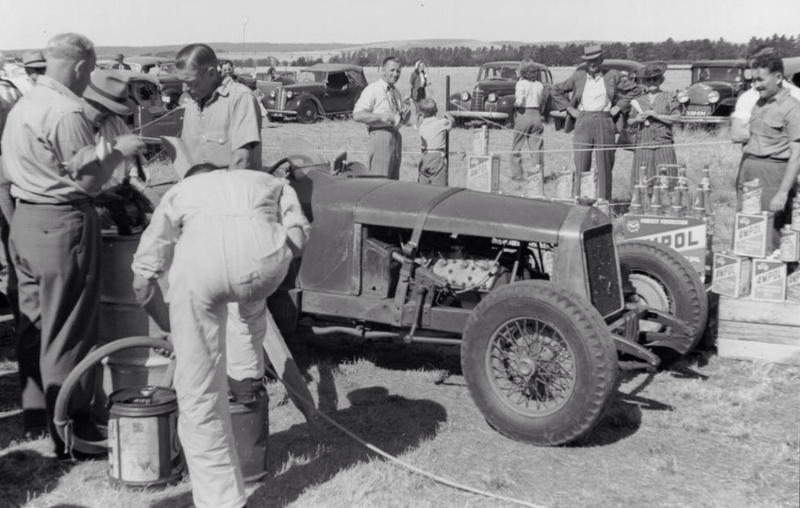 He rebuilt the engine, I have unearthed no record of the cars competition in his ownership, the car was sold post-war to Wangaratta, Victoria businessman/racer Ted Gray in 1944. Edgerton later raced an even more exotic Jano Alfa Romeo, the ex-Alf Barrett Monza, chassis #2211134 which he acquired in 1950. Gray, very attached to modified V8 engines having competed with the Alan Male owned Alta Ford V8 special pre-war, soon replaced the Alfa engine and gearbox with Ford components, in this form he raced the car extensively for the next few years. A Ford rear axle was also fitted. The work was performed in the workshop Ted and Bert Cox had in Little Bourke Street, Melbourne. The orginal engine and gearbox were not cast aside but put to use in a Singer chassis’d hillclimb special! John Blanden records that none of the major Alfa components were lost as the car was continually modified, which became important once the cars racing career was over twenty years hence and restoration commenced. Gray raced the car at the NSW Grand Prix meeting, the first post-war Bathurst in October 1946, he was fourth in the handicap race won by Alf Najar’s MG TB. Despite the lack of circuits in Victoria, perhaps his focus was on speedway Midgets at the time, he didn’t race further in the Alfa at Bathurst but did contest the NSW Racing Car Championships held at RAAF Nowra in April 1947. Tom Lancey won that handicap in an MG TC, with Ted a DNF due to overheating problems with the big V8 after seven laps. Bob Brown of Adelaide bought the car in 1949, he raced both locally and in Western Australia and Victoria including a big trip across the Nullarbor Pain to contesting the 1951 WA Hillclimb Championship in which he was tenth. A week later he also competed in the ’51 Australian Grand Prix at the round-the-houses street circuit at Narrogin, a small farming town 200 Km to the south of Perth. He failed to finish, lasting only 3 laps in the race won by Warwick Pratley in the Sydney built Ford V8 engined ‘George Reed Special’. It was the last AGP win for a ‘traditional Australian Special’. Its interesting that the only AGP the car contested was in 1951, noting the cars entry but non-start in the ’38 race at Bathurst. It’s intriguing as to why Jones did not race the car herself, or enter it for someone else during her period of ownership. Nor did Ted Gray, a most accomplished driver enter the car in the countries premier event during his time with it. They were Formula Libre handicap races after all, the beast in whatever form would have been welcome and a handicap determined appropriate to the the car spec/driver combination at the time. The car competed in an early Port Wakefield, South Australia meeting in May 1951 doing a 17.4 second standing quarter and recording 100 mph for the flying quarter mile. 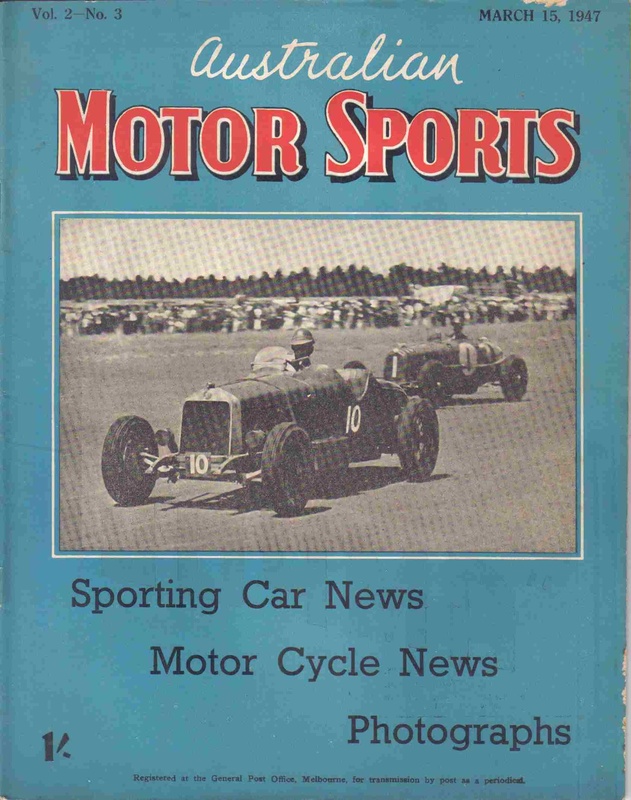 Adelaide’s Gavin Sandford-Morgan, owner, racer and restorer of many fine cars over the years was the next owner in 1952. 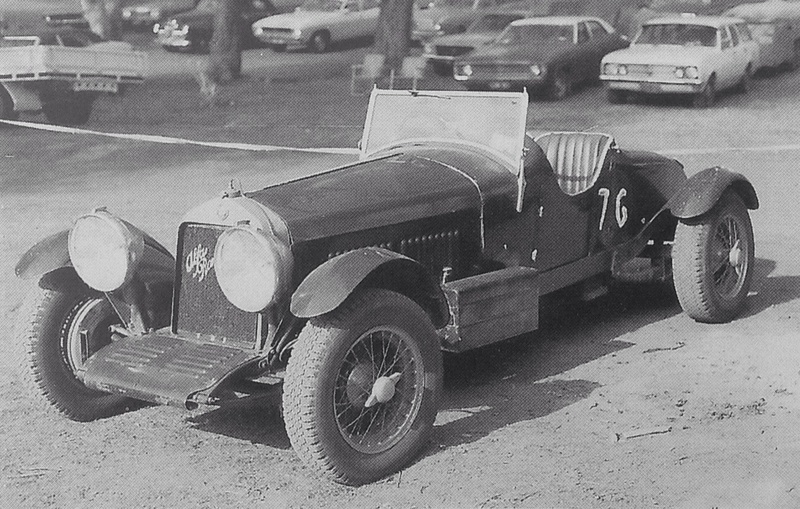 He ‘refurbished and repainted’ the car in time to run it at the opening Collingrove Hillclimb meeting at Angaston in the Barossa Valley in March 1952. He was 2nd in the over 1500cc class. Gavin soon sold the car to Bob Jervies of Broken Hill, he raced it in local events and at Collingrove and Port Wakefield. Going back a step, in 1950, when the car was owned by Bob Brown, Ross Lindsay left the road at the Woodside road circuit in the Adelaide Hills, hitting a stump, damaging the rear axle housing and a rear spring. More ‘butchery’ or keeping the car competitive to apply the perspective of a racer in period, occurred during Jervies ownership with replacement of the crashed, bashed, bruised and abused! Alfa chassis by a Fiat unit. An SS Jaguar front axle with Douglas aircraft brakes replaced the Alfa originals. At this point there was obviously little left of the car which left Milan in 1929, but again, the chassis was put to one side, not destroyed or trashed. In the late fifties or early sixties South Australian Tony Cullen bought the car running it in local events before it was acquired in partnership by Melbourne Alfista John Lawson and Terry Valmorbida in 1971. And so, the next period of this significant cars life began- it’s restoration phase. Lawson and Valmorbida acquired the cars original engine and ‘box. The much used and abused factory original Alfa chassis was saved by Ian Polson and sold by Noel Robson, who had kept it stored for many years, to Lawson, by then the sole owner of the car for $A20. Lawson also located the original front axle, steering box and brakes. The cars appearance was now original but unrestored. Whilst the original engine’s rebuild was completed a 6C2300 unsupercharged Alfa engine was fitted, in this form the car made regular appearances in historic events including the Mount Tarrengower Hillclimb and at Phillip Island in 1977 and 1978. Many of us remember with glee the cars re-emergence then, as a young Uni student I officiated at Tarrengower and well remember the car at that, hot, dusty meeting. Diana Gaze, nee Davison, another great Alfista given the cars she and Lex owned and raced, acquired the car in 1983 and commenced a long restoration which involved Bob Williams and Mark Rye in Castlemaine- they were responsible for the chassis and reproduction body respectively. David Rapley took on the engine and later was given the whole project at ‘mock up’ stage. Kew Ward painted it and Grant White made the upholstery. Diana Gaze sold the car after its restoration, the new owner then had the car ‘re-restored’ some seven or eight years ago with the mechanical components ‘freshened’. The original body and chassis rails were incorporated this time- a decade before these were deemed beyond economic repair but were retained with the completed car and incorporated into the last rebuild as befitting a car now worth in excess of $A4 million. ‘The 1750, and for that matter the 1500… must be among the finest ever made both from the point of view of engineering and driver satisfaction.’ – Michael Frostick, ‘Alfa-Romeo-Milano’. Enzo Ferrari persuaded Vittorio Jano to leave FIAT’s racing department and join him at Alfa Romeo. Jano was one of the greatest car engineers of the twentieth century with a career that spanned the decades right through to his revolutionary Lancia D50 Grand Prix car of 1954- the 1956 Lancia-Ferrari or Ferrari 801 won the drivers and manufacturers championships that year. 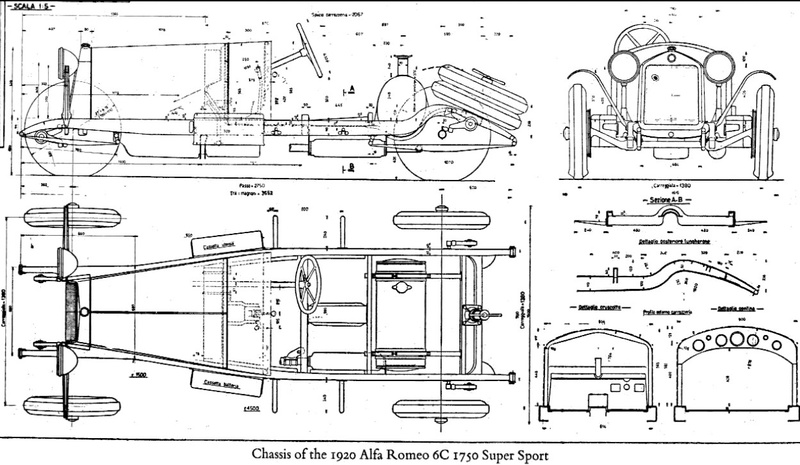 Jano designed both Alfa Romeo’s grands-prix and road cars. As a consequence these ‘roadies’ emerged, influenced as they were by their more exotic brethren, as some of the most exciting and sophisticated of their day, establishing the Milanese marque’s reputation for producing sporting driver’s cars arguably unmatched at the time. Jano arrived at Alfa in 1923. By the following year he had designed, and Alfa built the legendary P2. The P2 GP car achieved much race success and also provided the basis for Jano’s first production model- the 6C 1500 of 1927. The car was designed as a fast touring machine combining light weight with sparkling performance by use of a 1,487cc inline six-cylinder engine based on the P2’s straight eight, it produced 44bhp in single-overhead-camshaft ‘Normale’ form. The beautifully balanced machine had an engine mainly made of aluminium alloys of monobloc construction with gear driven camshaft(s) and five main bearings. The electrics were by Bosch with coil ignition. The multiplate clutch and gearbox drove the rear axle via a torque tube. 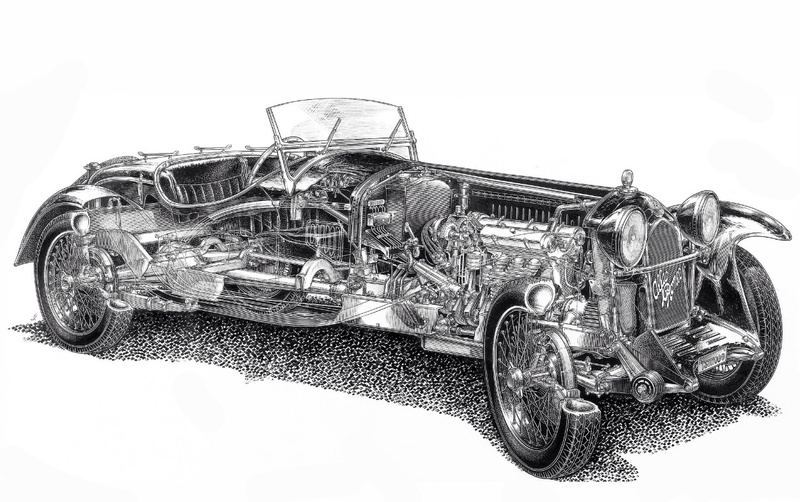 Suspension was by half-elliptics all around, brakes were mechanical, rod operated and fully compensated. The front axle was of C-section, the front springs passed through holes in the beam. Small rods forming part of the front actuation passed upwards and through the centre of the king-pins. Twin-overhead-camshaft ‘Sport’ and supercharged ‘Super Sport’ models followed, the latter being the first of its type to feature the classic open two-seater coachwork by Zagato forever associated with sporting vintage Alfas. Production of the 6C 1500 ceased in 1929 upon the introduction of the 6C 1750. 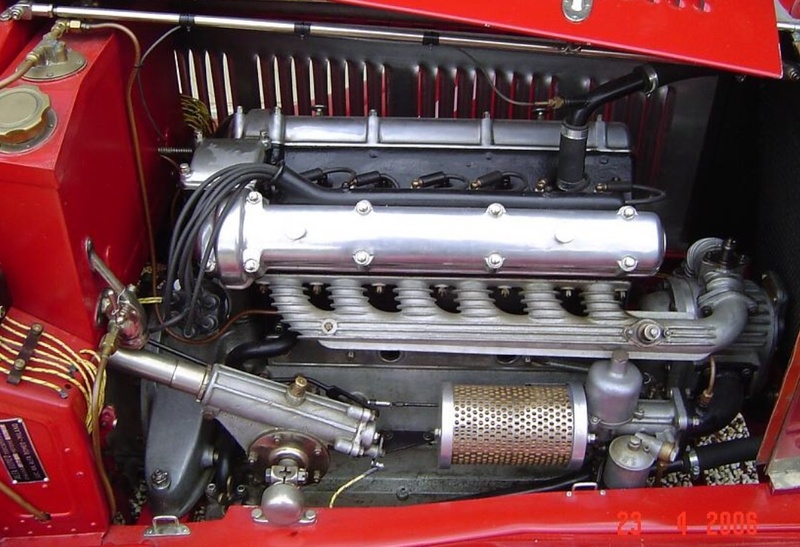 The 6C 1750 (1929-33) boasted a derivative of the 1500’s six-cylinder engine enlarged to 1,752cc. Built in single-cam Turismo and twin-cam Sport (later renamed Gran Turismo) variants it was an exciting, fast, touring car combining light weight with sparkling performance by the standards of the day, more than 120km/h (75mph) was achieved depending upon the coachwork fitted. Aimed at gentleman racing drivers, or gentlewoman racing drivers in the case of ‘#0312894’!, there was also a limited edition Super Sport, or ‘SS’, version, which later evolved into the Gran Sport. Produced only during 1929, the SS was available with or without a Roots-type supercharger fed by a Memini carburettor, the production split being 52/60 (blown/un-blown). Most of the cars carried coachwork by Carrozzeria Zagato or Touring with James Young bodying the majority of cars imported into the UK. The 6C 1750 SS was one of the most popular and successful sports-racing cars of its day. Twenty Alfas competed in the 1929 Mille Miglia, with seven in the top ten. The race was won, for the second consecutive year, by Giuseppe Campari and Giulio Ramponi. Other high profile victories for model included the 24 Hours of Spa Francorchamps, Grand Prix of Ireland and the 12 Hours of San Sebastian – all in 1929 – plus the 24 Hours of Spa Francorchamps and the RAC Tourist Trophy in 1930. The 1750’s sporting career, aided by its mechanical longevity, extended far beyond its production, which ceased in 1933. Mrs Jones’ cars competitive life extended well beyond 1933 of course, I doubt any of the 6C1750’s built were used in anger longer than this car! Got lost in the detail of that one Andrew, knew the general story but not the minutae- and it’s an Alfa so worth the ridiculous investment of time! You have done an awesome job here Mark!! Thank you it was captivating! I got carried away a bit, spent way too much time but am happy with a result. There is not much about on the lady or the car- both great competitors! Great story Mark – well done, with some amazing images. One lady for sure I would have liked to share a dinner and more than a few glasses of wine with. She would have been happy to talk about the merits of Vittorio Jano for sure! It’s a shame she didn’t start an AGP, she certainly had the experience- with the right handicap and luck, who knows?! Off topic but re Mt Tarrengower; when was it a 911 came down in small pieces? I have some photos I can’t date. It’s 1976 or ’77- I was still at Monash. A mate and I officiated on a corner above where he went off- he was an Ivanhoe or thereabouts GP- 911 RS? Will Darvall I think is the name in the back of my head. It was the most sickening sound I’ve ever heard. The brief squeal as the car lost adhesion and then a terrible, frightening, series of loud thuds as the car went down the gully pinging from gum tree to gum tree. The car was totally daffy-ducked, he survived but it took a while to come good. Certainly competed again but not sure what in. Interested to see the shots. can you drop me an email so i can reply with a link to share them? I’ve just finished reading Tony Gaze’s biography (a fascinating book indeed) which prompted me to go looking for pictures of Diana Gaze’s Alfa 1750 Zagato – and Google pointed me to this page. I just feel that you need to correct an error in one of the picture titles. The one with the car in front of the tyre wall isn’t at Philip Island. It’s at Speed on Tweed in Murwillumbah. I know this because I have taken several pics in pretty much the same spot. Thanks for your excellent work documenting this wonderful period in Australian motorsport history. Just made the change, such a significant Alfa Romeo in Oz racing history, be happy to own that chassis!